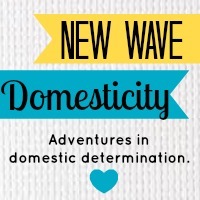 I would love to feature your blog, etsy shop, business, or project on New Wave Domesticity! Your sponsorship dollars go directly into helping this blog grow and I appreciate your support & hope that we can grow together! Blogging is about community and I am happy to offer ad swaps, just use to code below to swap. I am excited to learn more about your blog and projects. I also love hosting giveaways and featuring guest posts when they are a good fit for my audience, so please get in touch if you are interested. In addition, I am happy to occasionally do reviews for products or businesses. I will always declare any goods or sponsorship in my posts & commit to doing honest reviews. If a product is not a good fit for the blog or I have a negative review, I reserve the right to not post it. On the other hand, I absolutely love trying new products and sharing them with my readers, so I also reserve the right to gush and share far & wide when I discover something I love. I would be delighted to hear from you to get involved in other ways. I am always opened to teaming up with other bloggers for exciting new projects, guest posting, and opportunities - please get in touch! Email sarahswingset@gmail.com. I would love to do an ad swap with you! Feel free to grab an ad below or get in touch if you need a different size. Thank you so much!